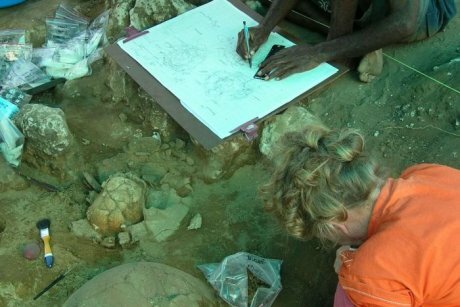 Scientists studying skulls found at a 3,000-year-old cemetery in Vanuatu say they may have unlocked a vital clue to the origins of Polynesian people. 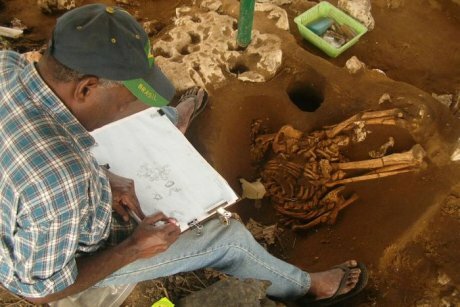 Professor Matthew Spriggs, from the Australian National University's (ANU) school of archaeology and anthropology, is part of a team that in 2004 discovered the oldest known cemetery in the South Pacific, at Teouma, just outside the capital of Port Vila. The excavation took place over several years, between 2004 and 2010. But the team's painstaking work proved well worth their time. PHOTO Matthew Spriggs (far right) with most of the Teouma dig team in the 2006 season. During the excavation they found about 68 graves, although curiously only seven heads. "The heads were removed as part of burial rituals and were taken away and put elsewhere," Professor Spriggs told 666 ABC Canberra. "But luckily for us, some of them were brought back in the cemetery and put on the chests of other bodies, or between their legs, or in pots sitting on top of other bodies." These seven heads turned out to be very significant, Professor Spriggs said. According to the professor and his colleagues, their discovery helps show that the Polynesians migrated from South-East Asia through Melanesia and into Polynesia, with little or no mixing in the early generations with the Melanesian populations of Papua New Guinea and the Solomons that had been in the region for the previous 50,000 or so years. PHOTO Fidel Yoringmal, the project's artist who has since passed away, drawing a Teouma skeleton. 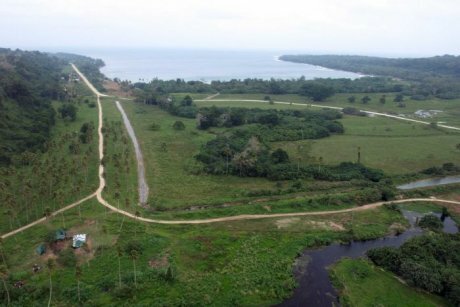 Professor Spriggs said the cemetery was proved be about 3,000 years old and related to the first known culture in Vanuatu and Polynesia, called the Lapita culture. "Before 3,000 years ago - although people had been in Australia, New Guinea and the Solomons for maybe 50,000 years or so - they hadn't got out beyond into islands like Vanuatu, Fiji, New Caledonia, and out into the further reaches of the Pacific," he said. "So this was exciting, because it was the first generations of people into Vanuatu." In a paper co-authored with other researchers from ANU and the French National Centre for Scientific Research, Professor Spriggs explained that the origin of Polynesian people had puzzled scientists since the first explorers' voyages of the 16th century. "You've got this problem," he said. "You've got South-East Asia and then you've got Melanesia in the middle with darker skinned people of different appearance, and then you've got Polynesians in the east." It has long been established that the Polynesians, who share similar physical features to people from South-East Asia, migrated from Asia. What is not clear is the route they took. "You have to get Polynesians out of Asia somehow," Professor Spriggs said. "You've got some people who have them going up through the north and coming down through north America, and then coming that way, from the Americas. PHOTO Teouma in Vanuatu from the air - the cemetery dig site is under the tent to the bottom left. "Others had them coming by various routes, either from the north through Micronesia or perhaps coming later or earlier. "What we're able to show is that in fact, for places like Vanuatu and New Caledonia and Fiji, they do arrive before there's anybody else here." 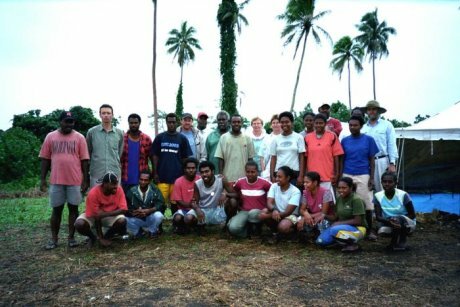 Professor Spriggs said the other major research finding was that not long after the arrival of the Polynesians in places like Vanuatu, Melanesians from further west began to arrive. "People in the New Guinea and Solomons area also jumping on these Lapita canoes and getting excited by the culture and travelling to new parts," he said. "Over time, and this is just over the first couple of hundreds of years in Vanuatu, the appearance of people changes from looking like Polynesians people look today, to looking like Melanesian people today." As part their research, Professor Spriggs' colleagues in Europe compared the seven skulls found in the Teouma cemetery with examples of skeletons from Melanesia and Polynesia. PHOTO Experts Fidel Yoringmal and Frederique Valentin at the Teouma cemetery dig in Vanuatu. "We work with specialist biological anthropologists ... they're the ones who've been doing all the measurement on what skulls we do have to compare ... in a forensic way, with modern populations today," he said. "What we found, which was a surprise for a lot of people, was that these first people in Vanuatu were Polynesian. Whereas today if you come to Vanuatu, the people are obviously generally of Melanesian appearance. Darker skinned, and not as tall as Polynesians would be. These [the people buried in cemetery] were very tall Polynesians." The skulls found at Teouma were similar in appearance and measurements to present day Polynesian and Asian populations. Professor Spriggs said this provided evidence that Polynesia was populated by people who came from Asia via Vanuatu. The next step is to examine DNA from the Teouma skeletons. "We're really working very hard on this at the moment ... we think we can. We're working on it with a team from Europe," Professor Spriggs said. He said DNA analysis could help confirm or discount the team's conclusions about the Teouma skeletons. "Or it could even narrow it down to where in South-East Asia these ancestors of the Polynesians, and these ancestors of the people in Vanuatu came from," he said.